At times of upheaval many yearn for bygone times while others seek refuge in dream worlds. In the estimation of Lars Gebhardt, Bellini’s ostensibly naïve opera LA SONNAMBULA goes closer to the bone than we might suspect. With Venera Gimadieva, Jesús León, Ante Jerkunica, Helene Schneiderman, Alexandra Hutton et al. When we think of Vincenzo Bellini, the first of his operas that comes to mind is NORMA. Yet LA SONNAMBULA is in no way an inferior work. With their semi-seria opera and its happy ending Bellini and his librettist Felice Romani produced a thoroughly modern psychological portrayal of the title character. Amina is betrothed, with the nuptial agreement already signed, but has not yet formally tied the knot with her Elvino. Of humble birth, she is due to wed the richest farmer in the village. When she wakes up one night in the bedroom of Count Rodolfo, who has returned incognito, her deceptively idyllic life in the Swiss alps is shattered. Elvino calls off the wedding and returns to his former flame, Lisa. Only when Amina appears like a spectre before the assembled villagers, somnambulating high above the ground and doomed if she were to fall, is her innocence apparent to all. When sleepwalking, she is no longer mistress over her senses. The romantically other-worldly setting of a remote alpine village reflected audience tastes of the time. Back track 200 years to the autumn of 1818. The monarchs of Russia, Austria, Prussia, France and Great Britain gather for the Congress of Aix-La-Chapelle to discuss ways to thwart the advance of democracy in Europe. The years that follow see decree upon decree being issued in an attempt to stifle the ideals of the French Revolution. The Ancien Régime enjoys a final flourish. In this indecisive halfway house between a yesteryear that is not quite dead and a morrow that has not yet dawned, in this twilight zone between ages, burghers retreat to their private spheres. Frustrated by the Restoration, they host evenings of music and discussion in their parlours and salons, found societies, pursue sports - and read voraciously. The early 19th century is marked by a sharp drop in illiteracy and a steep rise in the number of newly published works of literature. People go from reading one book many times over to reading many books once only. 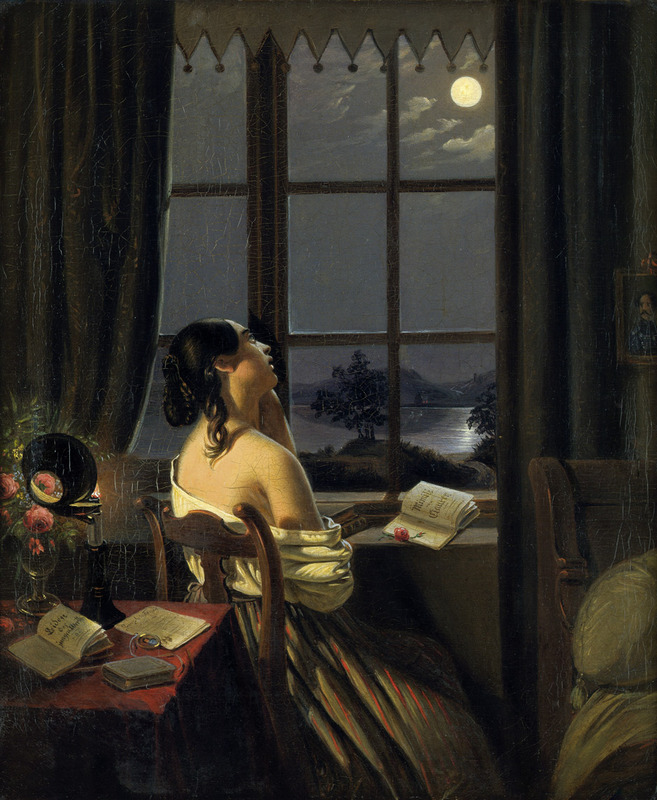 In Hasenclever’s “Die Sentimentale” the romantic reader’s thoughts are transported from the bourgeois salon to distant worlds. The bourgeois drawing room is a springboard to distant worlds. Literary figures of the Romantic period are enamoured of the opaque, the ambiguous – a mist to be filled with a motley blend of historical and fabulous material. Gothic horror stories packed with ghosts flutter across from the British Isles to the continent of Europe, machine-like people and androids trouble the imagination and supposedly mediaeval national myths such as the Scottish epic of Ossian are increasingly popular. The Middle Ages, with their castles, forests, knight errants and tales of courtly love are beloved of the readers of the time. Italian composers of opera, too, are on the lookout with their librettists for unusual material – and they find it in a Welsh wood (NORMA), the Scottish highlands (LUCIA DI LAMMERMOOR) and the mountains of Switzerland (LA SONNAMBULA). And escapism doesn’t end at the characters and settings. Private and political adversity leads opera protagonists to embrace altered states: the works teem with spirits, the undead, crazy people and sleepwalkers. In Vincenzo Bellini’s LA SONNAMBULA a ghost is scaring the inhabitants of a Swiss mountain village. “Ciascun la vide: è verità! / Everyone has seen it: it’s true!” In the end it turns out to be the youthful Amina who has been wandering the village at night. Because she is engaged to be married but not yet actually in wedlock, her emotional insecurity bursts to the fore. Amina sublimates her fears between states of wakefulness and slumber, between knowledge and ignorance, between control and subconsciousness. When she wakes in the bed of a strange man, her engagement is called off and she is shamed and cast out. Amina’s sleepwalking scenes are considered the “little sister” of the Romantic scenes of madness of a Lucia or an Imogene in IL PIRATA, and the music that accompanies them is correspondingly restrained. It is not the emphasis on madness, embellished with thunder and lightning and high-pitched notes hit that informs the music of the work but rather an interiorised fragility, which captures the uncertainty of the young woman. Bellini weaves adornments skilfully and judiciously into the proceedings, presenting a dreamily awake Amina with some of his most beautiful “melodie lunghe, lunghe, lunghe”. At the end of the opera, when she wakes and is suddenly reinstated as a bride, the music switches back to the “Viva Animal!” of the beginning. The world around her has changed as she slept: “Non mi svegliate voi! / Don’t wake me!” Amina yells. A few moments earlier she had been accused of infidelity and rejected by society; now she has the long-awaited ring on her finger. But the sugary-sweet happy ending is tainted.